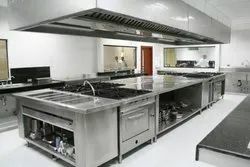 Pioneers in the industry, we offer kitchen designing & planning, commercial kitchen layout and industrial kitchen design- manufacturer from India. We will work with the Client and their representatives in ensuring that the correct “functional” layouts are incorporated into the resort. Provide operational inputs and assist in the space programming & finalization of drawings of the following Back of the House (BOH) areas. * Kitchen and ancillary areas. * House keeping areas, pantry, laundry and linen room. * Stores, receiving, cold storage, dry and wet storage. * Administrative offices and areas. Provide operational inputs and assist in the space programming & finalization of drawings of the following Public Areas (PA). * All food and beverage outlets. * Front office, reception, lounge and lobby. * Recreational areas – Swimming Pool / Health Club. * Banquet and conference facilities. Provide operational inputs for the in-room facilities and their positioning. 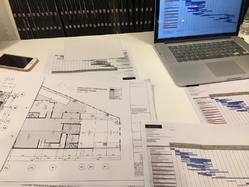 Concerning interior design, whilst we are not an interior design company and do not pretend to be, we have a great deal of expertise in the usability, wear and tear and general recommendations as to what will function well and last for a sufficient period of time. We can give input on any concepts that may be introduced such as restaurant, bars, health spa, banquet space. Design & Layout of Restaurant & KitchenThis encompasses the design and layout of the restaurant, Kitchen and support areas to result in the maximum utilization and potential of space. In case of the service areas, considerations will be given to plumbing, drainage, water supply, electrical loads, grease traps and ventilation - in order to ensure that each area is well utilized and allows for ease of operations thus resulting in greater efficiency. Work Flow This will encompass the positioning of specific areas to result in the most ideal work flow providing a synergy of efforts maximizing efficiency and increasing productivity thus reducing relative costs and generating higher profitability for the owners. Equipment Recommendation & Procurement The type equipment selected is very crucial, as it will determine the efficiency of production and the desired quality of the end product. Naturally, budgets, productivity and operating specs will be of prime considerations. Equipment Recommendation & Procurement The type of equipment selected is very crucial, as it will determine the efficiency of production and the desired quality of the end product. Naturally budgets, productivity and operating specs will be of prime considerations. Services will encompass the identification of the appropriate equipment, developing a comparative analysis, which highlights the advantages or disadvantages of relevant equipment for selection. This will be based on potential productivity, efficiency, ease of operations and aesthetic value. Sourcing and receiving of quotations of relevant equipment from international and domestic suppliers will be done, assisting in the ordering process. A major parameter considered in recommending a product would be ‘serviceability’ of the product. BOQ and equipment will be presented. Looking for Kitchen Consultancy ?